Senator Dan Dawson, an Abraham Lincoln High School graduate, is the third generation from his family to reside and work in Council Bluffs. Senator Dawson and his wife, Chrystal, have two children: Alex and Madelyn. Senator Dawson graduated in 2008 from Bellevue University in Bellevue, Nebraska, with a bachelor’s degree in criminal justice administration. He currently serves in the Army Reserves, where he earned his current rank of Chief Warrant Officer. He has honorably served his country for the past 20 years, mobilizing four times with deployments to Kosovo, Iraq, and twice to Afghanistan. 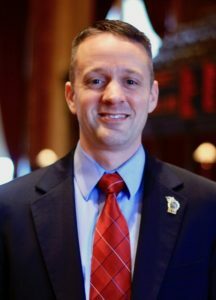 Following in his father’s footsteps to serve as a law enforcement officer in Council Bluffs, Senator Dawson worked in the Pottawattamie County Sheriff’s Office before joining the Council Bluffs Police Department. He is currently a special agent with the Iowa Division of Criminal Investigation, where he works in the Major Crimes Unit. Senator Dawson is a member of St Patrick’s Catholic Church of Council Bluffs, Knights of Columbus, the American Legion, and Veterans of Foreign Wars. He has also served as a director in the state police union.